my new Smittybilt X2O-10k Gen 2 Comp (synthetic) winch came in, this will be the first winch i've ever owned! i ordered from Northridge4x4.com since they are having a 10% off Smittybilt sale right now, so it was $492.00. this is a chinese built winch, but so are the new entry level ones from Warn. for the type of wheeling i do and my typical terrain, a winch is a luxury item - so i'd just never pay a ton to have one. if i wheeled back east or in the midwest where nearly every trip involves some bottomless mud hole, i'd probably feel differently. this is mainly for difficult rock crawling trails where i might get in over my rig's capabilities and asking the guy in front of me to pull me through obstacles constantly would get annoying. a couple issues came up when researching these, which may have been addressed in the current generation. they've also upgraded the warranty to lifetime mechanical and 5 year electrical. the switch on the control box to enable wireless control was a common failure. it looks like Smittybilt now uses a different switch, similar to the waterproof one that people were swapping in as a fix. also, on another forum a guy had a mounting bolt fail, letting one side of the winch go and twist up. mine did come with supposed grade 10.9 bolts for the winch mount, and grade 8.8 for the farlead. but, i'm going to swap them out with some locally sourced bolts anyway - cheap insurance. also, you used to have to disassemble the entire remote to change the battery for the wireless portion. they now have a little door on the back held tight with a single screw. i went ahead and replaced the included no-name battery with an Energizer, and then wrapped the original up in some foam and stuck it in the dead space inside the remote for a spare. so has anyone else had experiences with Smittybilt winches - good or bad? Kris, mine occasionally “chatters.” I think it is caused by the contactor having corroded contacts. Someday, I’ll have to remove it and either clean the contacts or replace the unit. Other than that, it has worked great. Your nylon line should probably be replaced every three to five years due to build up of abrasive gunk and UV hammering. i've only used the winch a couple times so far, and just for spooling the synthetic line under load as recommended. i headed over to a fairly flat wash, hooked a tree strap up and engaged the parking brake just a bit to provide some rolling resistance. both times i used the wireless mode for the controller and it worked great. i had heard that some of the cheaper winches with wireless are glitchy and slow to respond to button presses, but no such issues on the X2O. there also doesn't seem to be any problem with the wireless range due to having mounted the control box down inside the metal bumper. i crossed the swollen Aqua Fria River a couple weekends ago, fully submerging the winch and control box in the process. 3 days later the wireless mode would no longer function. plugging in the controller still worked fine. i have a hard time even believing that a single submersion and 3 days time resulted in that much corrosion! even though Smittybilt has upgraded this switch with a rubber boot on these Gen 2 models, it it's still only splash resistant - not waterproof. inside the control box, the actual solenoid and the wireless receiver modules both appear to be sealed well individually. so hopefully this minor switch death is the only problem i have. 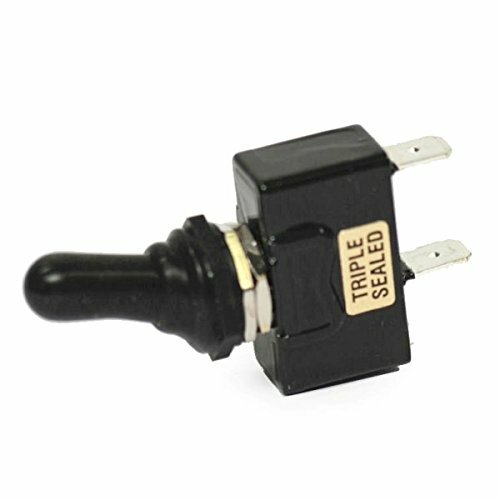 i ordered this K-Four "triple sealed" toggle for a permanent replacement. Have you considered mounting the switch inside the cab? It will stay dry and probably be easier to reach. anyway, i decided against that for now simply out of laziness! i didn't want to run yet another wire through the firewall or give up one of my last 2 free switch spots that i've already got wired (saving those for some extra lighting). if this new sealed switch doesn't work well then i'll certainly re-think an in-cab switch!